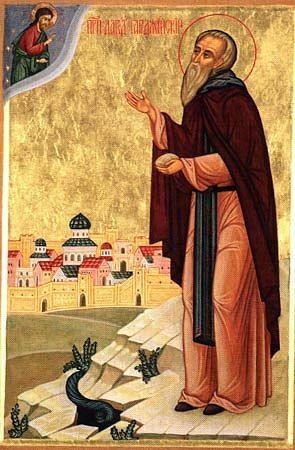 Saint David of Gareji was Syrian by birth. The future ascetic became a disciple of St. John of Zedazeni and journeyed with him to Georgia. St. David and his spiritual son Lucian settled on a mountain above Tbilisi, the capital of Kartli. At that time Kartli was constantly under threat of the Persian fire-worshippers. St. David would spend entire days in prayer, beseeching the Lord for forgiveness of the sins of those who dwelt in the city. When he was finished praying for the day, he would stand on the mountain and bless the whole city. Once a week Sts. David and Lucian would go down into the city to preach. A church dedicated to St. David was later built on the mountain where he labored. St. David’s authority and popularity alarmed the fire-worshippers, and they accused him of adultery, in an attempt to discredit him in the eyes of the people. As a “witness” they summoned a certain expectant prostitute, who accused him of being the child’s father. Hoping in God, the holy father touched his staff to the prostitute’s womb and ordered the unborn child to declare the truth. From out of the womb the infant uttered the name of his true father. Outraged at this slander, the bystanders savagely stoned the woman to death. St. David pleaded with them to stop, but he was unable to placate the furious crowd. Deeply disturbed by these events, St. David departed the region with his disciple Lucian. The holy fathers settled in a small cave in the wilderness and began to spend all their time in prayer. They ate nothing but herbs and the bark of trees. When the herbs withered from the summer heat, the Lord sent them deer. Lucian milked them and brought the milk to St. David, and when the elder made the sign of the Cross over the milk it was miraculously transformed into cheese. A frightful serpent inhabited a cave not far from where they lived and attacked all the animals around it. But at St. David’s command the serpent deserted that place. Once local hunters were tracking the fathers’ deer, and they caught sight of Lucian milking them as they stood there quietly, as though they were sheep. The hunters paid great respect to St. David and, having returned to their homes, reported what they had seen. After some time St. David set off on a pilgrimage to Jerusalem. He entrusted Lucian to fulfill his responsibilities at the monastery and took some of the other brothers with him. When the pilgrims were approaching the place called the “Ridge of Grace,” from which the holy city of Jerusalem becomes visible, St. David fell to his knees and glorified God with tears. Judging himself unworthy to follow in the footsteps of Jesus Christ, he was satisfied to gaze upon the city from afar. Then he stood at the city gates and prayed fervently while his companions entered the Holy City and venerated the holy places. Returning, St. David took with him three stones from the “Ridge of Grace.” That night an angel appeared to the patriarch of Jerusalem and informed him that a certain pious man named David, who was visiting from afar, had taken with him all the holiness of Jerusalem. After St. David brought the miraculous stone from Jerusalem, the number of brothers at the monastery doubled. The venerable father ministered to all of them and encouraged them. He also visited the cells of the elder hermits to offer his solace. In accordance with his will, a monastery in the name of St. John the Baptist was founded in the place called “Mravalmta” (the Rolling Mountains). The Lord God informed St. David of his imminent departure to the Kingdom of Heaven. Then he gathered the fathers of the wilderness and instructed them for the last time not to fall into confusion, but to be firm and ceaselessly entreat the Lord for the salvation of their souls.